I couldn’t resist those adorable peeps this Easter season. I wanted to create a treat that was fun for the kids at Riley’s daycare to take part in making with their families. So I created my own version of a popcorn ball using none other than Peeps. Intrigued?! Very cute idea! What do the balls look like when they are made? Are they colored like the peeps? How fun is this! Super cute idea for the kiddos! They are going to love it! I love it! What a great idea! What kid wouldn't love those? I'm curious too……Are the popcorn balls colored like the peeps? So creative! What a great gift. Love this! Such a fun little gift. These ideas are so fun! Such a cute little gift! Thanks for sharing! I'm your newest follower! Come visit if you get a chance! Very cute gift idea. You could give this for other seasons that they make Peeps as well! So cute!! I bet they're tasty, too! Looks adorable and sounds delicious! Thanks for sharing at Bringingbeauty! What a cute idea…I'm sure they will be a hit! Thanks for sharing at Shine on Fridays!! Oh..these are gebius!! What a fantastic idea!! Thank you for linking up! This is such a cute idea! Thanks for linking up to Terrific Tuesdays. This is such a cute idea!! what a great little treat to give out for Easter. Thanks so much for sharing this with us at Sharing Saturday. Hope to see you again next week. These are pretty cute and creative! Even though I don't care for Peeps myself, the kiddos always like them! Thanks for sharing at Handmade Tuesdays. CONGRATULATIONS!!! Your party idea is being featured at Menu & Party Idea Round Up. Thank you for sharing your idea with us at Cast Party Wednesday. Please grab a “featured” button. This is a great idea! Perfect for teacher’s gifts! Love that! What an adorable gift idea … I pinned it! What a great idea. 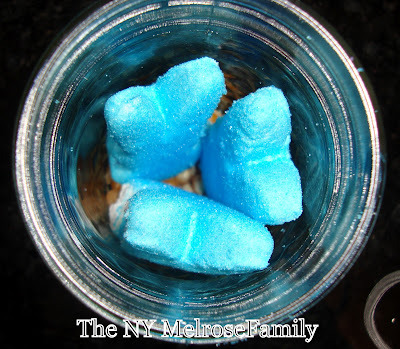 I LOVE peeps too…it’s an addiction actually!! Adorable – what a fantastic gift idea! How fun are these?! What a great idea! Can you tell me how much popcorn you put in bottom of the canning jar for the popcorn ball peeps ? – Awesome idea can’t wait to make them – thanks for sharing !!! Somehow that go erased when I updated this recipe Michele. I’m so sorry about that. It’s 1/4 cup of popcorn kernels.